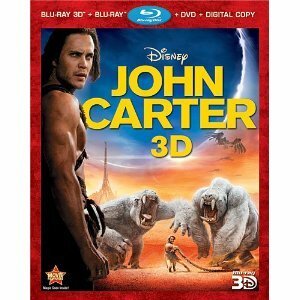 John Carter was a major flop for Disney. 200 million to produce and it very poorly at the box office. 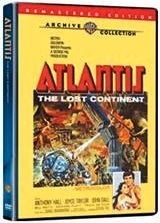 This 4 disc set is expensive (retails for $49.95) but you can get it for nearly half that if you look around. So was it really that bad? No! Not having read of the Edgar Rice Burroughs books I went into viewing this a “John Carter” novice and I was not disappointed at all. What you have is a good old fashioned adventure film with a handsome hero, with a good amount of humor thrown in, in an exotic locale (can’t get more exotic than Mars) and a beautiful, smart and tough princess to rescue (Dejah Thoris) from an evil, power hungry bad guy. Also, there is an ancient tribe of non human aliens with their own sub-plot and language, great voice acting from Willem Dafoe, and of course, a Disney throw in alien dog like creature. Story line is fast oving and I really liked the Edgar Rice Burroughs tie in at the beginning and end. The 3D disc do not disappoint with tons of special effects that are totally enhanced while watching in 3D. The effects look better in 3D and are not just thrown in because its a 3D movie. No pointing swords coming out of the screen as in Pirates 3. I found all aspects of the production to be first rate. If I would improve anything, I’d dig a little deeper into the cultural aspects of the different civilizations on Mars but then the film would have been 3 hours long. If you want more, read the books. 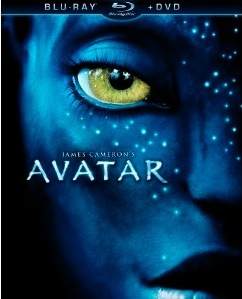 Extras are included on the 2 D blu-ray and feature Disney second screen; a great way to watch additional info on your ipad while watching the 2 D version of the film, bloopers, deleted scenes with commentary, a 100 years in the making documentary from pulp novel to film, 360 degrees of John Carter, which explores the film’s production, and audio commentary during the film. As usual, Disney throws in a lot of materials to supplement the disc set. You also get a DVD copy with extras and a digital copy. This film got a bad rap; its not that bad and production values are very good. I found it very entertaining and fun to watch in 3D. Its also pretty much family friendly. Price is restrictive, even for 3D, but get it on sale and you’ll be a happy camper. What can be said that already hasn’t been said ? Well, I have a few thoughts and observations about James Cameron’s zillion dollar film. First about the blu-ray-the disc is without a doubt a system show off disc-it has one of the clearest, sharpest and best looking pictures I’ve ever seen on blu-ray. That’s the good part.